Raw soups are a great way to add variety to your raw diet. They are simple to make with minimal clean-up and they are very easy to digest. Soups are basically a smoothie that is mostly if not all vegetables instead of fruit. It helps to have a high speed blender like the Blendtec or Vitamix, but just about any blender will work if you make small enough batches. For a soup you need to have most of the ingredients be water rich or you’ll end up with a thick sauce or chowder. You can use the same base of simple ingredients for a variety of soup recipes, by adding different herbs and spices, vegetables, sea vegetables, or nuts and seeds to the base. Cucumbers, celery, tomatoes and bok choy are just a few of the water rich foods that make a good base for any soup. Soups also package up and travel well so you can take them to work, pot lucks, outings and hikes. In fact one of the great things about soups is that they are so easy to digest. If you’re an active person and don’t like the full feeling you have for hours after a meal then soups might just be the ticket for you. Because they are so easy for your system to digest you’re gleaning more of the available nutritional value from the food. Most of us don’t chew our food sufficiently to allow them to be digested fully. In essence you’re getting more nutrition for dollars spent as opposed to eating solid foods. And if you happen to eat your evening meal within 3 hours of your bedtime soup should greatly enhance your sleeping experience because it should be out of your stomach before you hit the sheets. For those of you who are looking to clean up your act, but do not have the time or inclination to do a full cleanse or fast, eating soup every night for a week would be a great way to give your digestive system a rest and do a mini cleanse. Now if you combined that with green juices and or green smoothies during the day you would have a phenomenal cleanse program and probably without much physical discomfort at all. In addition to all these healthy benefits, raw soups are very easy to make and can actually be a lot of fun as you create your own tasty recipes. One of my favorite things in the kitchen is using up what’s available and incorporating it into a wonderful meal, and this so easy to do when you’re making a soup. Check out all the recipes below and try the ones that appeal to you. And please come back to check out new recipes as they’re added and to post your own favorite raw soup recipes so everyone can enjoy them. 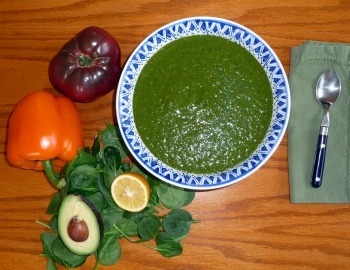 Do you have a great raw soup recipe? One that make your mouth water just to think about? Share it here so we can all reap the health benefits and savor the goodness that you created!